I was desperate for non-law books after my Fall semester last year. I also wanted to only read about Dukes. Well, after I ran out of Dukes in my titles, I noticed this book. I started reading to see what he was an "heir" of, and I was hooked. I cannot put the book down, and I ended up staying up all night to finish reading. I love the dynamics of Gayle and his brothers. I am a sucker for having a good and fun brotherly relationship...even half-brothers. Gayle's parents, who should have been annoying as they interfere in his life a lot. They wanted Gayle married and get on with the business for heir-production. I find his parents adorable. 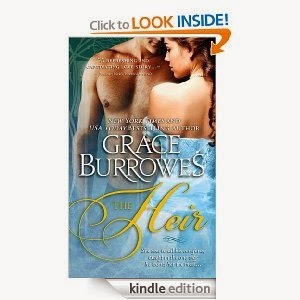 Grace Burrowes has an excellent talent of making a reader fall in life with all his characters. It is simply a treat to read her books. I would put her right along my most favorites of authors: Eloisa James (dare I say even better than? ), Julia Quinn, Susan Elizabeth Phillips, Jennifer Donnelly and Nora Roberts (on the brother/sister dynamics, but I find Burrowes books much better overall than Roberts).